Both Blogger and WordPress have an option to put the site offline or make it unavailable permanently or temporarily. You may need to put your site offline for a number of reasons. 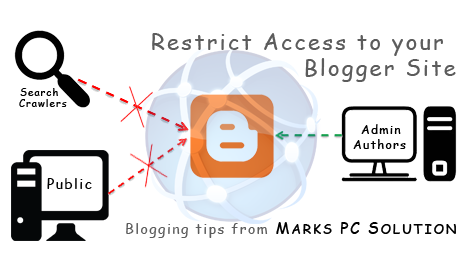 In this post, I will just talk about how to limit access to a blogger site. At the same time, you can deny the search engines to access your site and you can also restrict general people to view your contents. You can restrict search engines to crawl your site. Because you would like to decorate your site first. In that case you can limit search engines' access. You may need to make your site unavailable temporarily due to political violations or religious issues. Or may be the site could be a private one. Maybe it's subject to be unavailable to the public. Go to Blogger Control Panel/ Settings/ Dashboard. Choose Settings from the left pane. Select Basic > Basic > Privacy. Choose No for both options as below. Hit on the Save Changes button. The first No doesn't matter much. But the second No matters! If you choose No in the second option, your site will not be crawled by search engines. But everyone will be able to access your site. Go to Blogger Control Panel > Settings. Choose Basic under the Settings option. Find the Blog Readers option under Permissions section. Here you have three choices: Public, Private (Blog Authors), Private (Selected Persons). If you choose the second option, only blog authors will be able to access the site. Other people will just get a message - This is a private blog. If you would like to add some readers, then choose the third option. Then add readers from your contact list or you can type their emails. Whenever they try to access your site, they have to log in. Finally, hit on the Save Changes button. If your site is totally new, then you can use the Privacy option only. You can stop search engine crawl your site. Because search engines will not find enough contents in a new site. That's why it's better to write first. Then you may let search engines to index your site. But you can keep your site Public. Later I will discuss the same thing for WordPress site. By default, Windows folders look like a yellow folder. And if you use any custom theme, it may change. 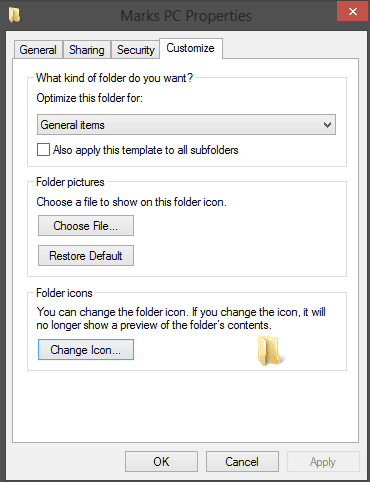 Many of you might know how to customize the Windows Folder Icon. It's very easy to change. Previously I discussed about how to change the pen drive/ hard drives icon. Today I'm gonna discuss about changing the folder icon. It's been few months when I published any Windows trick. Sorry for the long break! To change the folder icon is much easier than changing the drive icon. If you wanna change the drive icon, you have to use an autorun file. But you don't need any notepad file to change the folder icon. All you need is just an icon format (must be .ico) image. I prefer using IcoFx. Download it and convert your image into icon within seconds. After getting the icon, you can go for the next step. Copy the icon that you wanna show in the folder. Go to My Computer (Start + E) or any location where your desired folder is located. Paste the icon within that folder. Press Backspace to get out of this folder. Now click right mouse button over the folder and go to the Customize tab > Change Icon as shown in the image below. After hitting the Change icon button, you will get a list of Windows Icons. You can use any of them. But here I'm gonna use the custom icon. So you have to click on the browse button. After hitting the browse button, you have to locate the folder again. Go to the folder and choose your custom icon that you've copied in the first step. Now hit on Open > Apply > OK. And you're done! Restart your PC if you don't see any change. Note: It's not necessary that the icon needs to be copied in your desired folder. Windows can show the folder icon from any other folder. But when you take that folder through a CD or Pen Drive, you may not get that icon with the folder. That's why I'm recommending to keep the custom icon within this folder. For more tips on Windows, visit this page . . .
Excel users often face a common problem. Normally you can't type two or three words in a cell in Microsoft Excel. You have to merge cells to type something. But if you have no option to merge cell horizontally then you may fall in trouble. Believe it or not, last week I had the same problem while working in a worksheet! 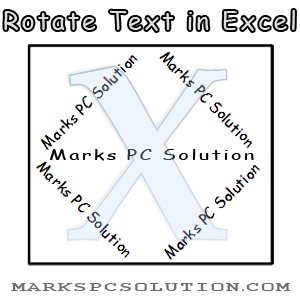 By default, you can't type like the image above in MS Excel. Have you noticed - I haven't merge the rows or colums. And there are 3 lines in Column A and 4 lines in Column B. Try to type multiple lines in a row or cell. Simply you can't. You have to use the Wrap Text option to type multiple lines in a cell. Format Menu > Font > Format Cells > Alignment > Text Control > Wrap Tex (Check the box) > OK. I'm not sure about this command. But the main point is - find the format cells window and then check the wrap text from alignment tab. You can also press Shift + Ctrl + F to open Fomat Cells dialogue box. Go to the Home Tab > Click on the Marked area of Alignment > Now you will get Format Cells window (Shift + Ctrl + F) > Choose Alignment tab > Check the Wrap text option > Hit OK.
Maybe it's very time consuming for you. I'm gonna share a secret shortcut! 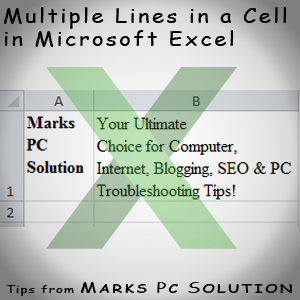 First I've typed Marks PC, then I pressed Alt+Enter and typed Solution. But remember, first you have adjust the column size. Adjust the column size and then type your text. Once you press Alt+Enter, new lines will be creating automaticlly when the cell area ends. Have you noticed the market button? It's in the Alignment section, just below the Review Tab. This button is a shortcut to wrap text. Type your text and hit on this button to create multiple lines in a row/ cell. You can adjust the column size after typing the text. Your lines will be adjusted automatically. If you're a Photoshop user, you must know about transparency grid. Transparency Grid is a checkerboard which appears when you're working with an image with transparent background. 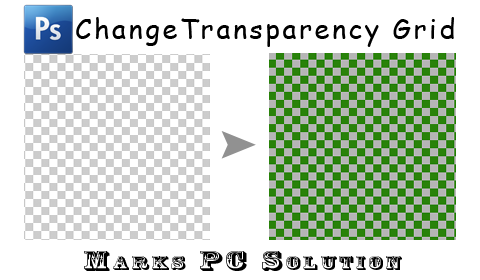 If your image has no color in the background, this checkerboard appears behind the image. Okay fine. Transparency will be indicated by the checkerboard. But you may ask, why I will change the color of transparency grid. In this post I'm gonna answer this question. And I will also show, how to change the color of the transparency grid. Suppose you've an image with white background. And you need to remove this background behind the image. You know there are different ways to remove background. I'm not gonna discuss it here. In the critical part of the image, Magic selection tool may not be able to select the white part. In that situation you can manually select the unselected portion. But you may also fail remove the white background properly. Because you can't select the white background as your default transparency grid is looks like a checkerboard that contains white color! So after saving the image you will notice there are some scattered white spots in the background. To get rid of this problem, you can change the default transparent grid. Select Preferences > Choose Transparency & Gamut. Now you will get the Preferences window with Transparency option selected. Keep the Grid size Medium or as your wish. Choose Dark from Grid Colors. Or you can customize the color using the custom option. You can also use any other color from the list if any of them is suitable for you. Hit OK after choosing the Grid colors. Remember, the default grid color may need to changed when you're gonna remove any white background from your image. Or background that is light black. Otherwise you don't need to change it. You can totally turn off the grid! Yes! If you're bored with the grid that is shown for transparent layer, then you can turn off the grid from preferences window. Go to the Grid size as shown in the image above. And choose None. Now create a new document from your Photoshop with transparent layer. You will just see white background instead of a grid. But your image will have transparent layer. 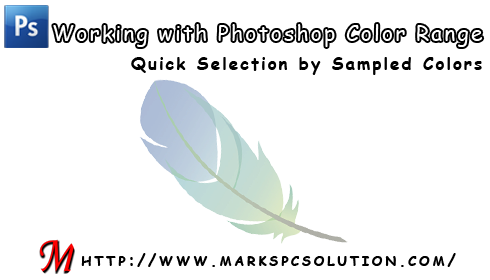 Photoshop guys are very familiar with the color range option of Adobe Photoshop. Color range command is a great tool for selecting the areas of an image based on sampled color. And it's somewhat similar to Magic Wand Tool. 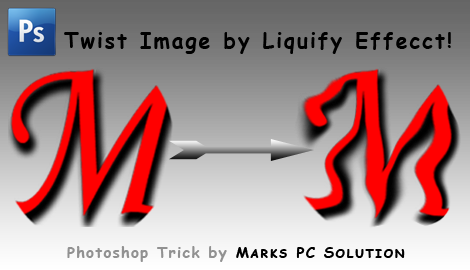 In Magic Wand Tool you need to manually click on the areas of an image that needs to be selected. But if you use the color range option, you just need to choose the sample color. And Photoshop will make the selection by itself! This tutorial applies to all running versions of Adobe Photoshop including CS4, CS5 and CS6. But I've prepared the tutorial using Photoshop CS5. All the images of this post will be based on Photoshop CS5. Have you noticed Marks PC Logo on color range window? Here the white part is currently selected. If you would like to expand the selection area then click on the pencil button from the right side with plus mark. Now go to your image and hit on the part that you want to add to your selection. Make sure Sapmled Colors is enabled in the Select option. You can also increase/ decrease the amount of Fuziness adjust the selection. If you make any wrong selection or if you'd like to remove something from your selection then choose the Pencil button with negative sign. Then hit on the part of image you want to deslect. The three tools just below the Save button is know as eyedropper tools. The left one is called Eydropper, middle one is Add to Sample and the right one is Substract from Sample. I've told earlier that Fuziness will control the amount of selection. By increasing and decreasing the range, you can control the amount of selection. And Range will control how much area of the image will be selected. To be honest, color range command is somewhat difficult to explain. You need to practice it by yourselft. If you click on the options, increase or decrease the value of different fields, you can easily understand. So, try to explore!